Do you travel for your own business? Do you have employees who travel? Make sure you know travel expenses are deductible - and what's not. 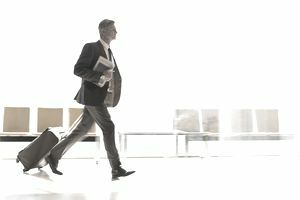 Business travel is a specific term determined by the IRS to describe travel away from your tax home that is "substantially longer than an ordinary day's work" and that requires you to sleep or rest while away from home. You must also sleep away from home to be able to deduct these costs. The travel must also be "temporary" (lasting less than a year). You can deduct costs to travel by train, bus, or airplane between your tax home and your business destination. For travel by ship, see the section on cruise ships below. Car/Truck: You may deduct costs of operating and maintaining your car or truck, using either actual expenses or the standard IRS mileage allowance. If you use the standard mileage allowance, you can also deduct tolls and parking expenses. Read more about car/truck travel expenses and the IRS standard mileage rate. Taxi, commuter bus, airport limousine: You can deduct costs to take you from an airport to your hotel or to a business location. Baggage and shipping: Costs for baggage delivery or for shipping business materials between your regular work location or tax home and a temporary work location are deductible. Lodging and meals: You can deduct expenses for lodging and meals while away from home on a business assignment. You can submit actual expenses or use per diem rates, as determined by the IRS. Conventions and Trade Shows: If you travel to a convention or trade show, you may need to show that the convention is directly related to or associated with your business. If you have a sales booth at the convention, that would qualify. If you are a delegate to a convention, the purpose of the convention must relate to your business. Cruises: Cost of travel on cruise ships, even for direct or associated business purposes, is limited. You may be limited to a total of $2,000 of costs for the cruise, and other limitations may apply. Be prepared to provide documentation that the cruise activities were related to business purposes. The most important part of the process of deducting travel expenses is to save all of your receipts. You don't have to save paper copies, but you should be able to pull out a separate receipt (not just a line item on a credit card) to show (1) date (2) expense details (3) amount spent and (4) business purposes. Be as specific as possible. Don't forget that travel expenses must be, as stated by the IRS: "ordinary and necessary expenses incurred while carrying on your trade or business." Learn more information on tax deductions for business travel on the IRS website. This article presents general information; the author is not a tax attorney or tax preparation specialist. Refer to IRS publications and refer questions to your tax consultant. Business Travel Expenses vs. Commuting - What's Deductible? What Is a Tax Home and Why Do I Need One? Should You Give an Employee a Company Car? What Is an Easy Way to Calculate Business Miles?